Every election cycle, pundits dwell on the perceived fissures within the Republican Party. It is often wondered aloud whether internal divisions over issues like abortion, immigration and trade will ultimately tear the Republicans apart, the way the slavery issue did its predecessor, the Whig Party. It sounds completely unrealistic, on the other hand, to consider a similar fate for the Democrats. Perhaps this is because it has existed since the formation of our two-party system, and is thought even by conservatives to be a permanent fixture, whereas the younger GOP must repeatedly prove its viability. If you follow the Democrats' behavior, however, you'll see that it is they who are repeating the mistakes that destroyed their former opposition parties, the Federalists and the Whigs. Early in America's history, party identification was chiefly determined by foreign sympathies, with the Democrats (then called the Democratic-Republican Party) being the pro-French party (at least they're consistent on something), while the Federalists were pro-British. After the War of 1812, during which the British torched both the White House and the Capitol, it wasn't very popular to be a Federalist anymore. This was especially so because the Federalists had continued to oppose the war while it was being fought on American soil, and even met to discuss the possibility of secession when it looked as if the U.S. might be conquered. After the Battle of New Orleans, General Andrew Jackson returned as a hero and future leader of the Democratic Party, while the rival Federalist Party dissolved in its own acidic fomentations. If the U.S. and its allies continue to succeed in the War on Terror, the modern Democratic Party could pay a similar price for its disloyalty, which it has put on conspicuous display since almost the very start of the conflict. Former Vermont governor Howard Dean, who is likely to become the new chairman of the Democratic National Committee, said just over a year ago that Osama bin Laden deserves the presumption of innocence. A couple weeks earlier, he'd called it a "most interesting theory" that President Bush had known about the terrorist attacks ahead of time, and deliberately allowed them to happen. Someone who didn't know better might wonder how a major American political party could even consider picking someone like Dean to represent it. In reality, he is just one among many in his party making those kinds of statements. Since the start of the war, prominent Democrats have been comparing their domestic political opponents unfavorably to our foreign enemies, baselessly accusing President Bush of lying while credulously soaking up anti-American propaganda, predicting doom for American soldiers, impugning the motives of the U.S. and its allies, accusing our military of wrongdoing at every opportunity, and generally behaving like defense attorneys for bin Laden and Saddam Hussein. Like the Federalists before them, the Democrats have maneuvered themselves into a position from which their interests are diametrically opposed to those of their country. What's good for the United States is bad for the Democratic Party, and it shows in their refusal to accept positive developments from the war. Just for one example, most elected Democrats haven't managed to be nearly as enthusiastic about the historic elections in Iraq as they were in announcing the thousandth American soldier killed since the invasion. Not content to follow only one proven recipe for self-destruction, the modern Democratic Party is also going the way of the Whigs. The successors to the Federalists, the Whigs were founded in 1833 to slow the momentum of the Democrats, who had gone virtually unopposed for over a decade. Alarmed by the unprecedented power wielded by President Jackson, the Whigs borrowed their title from the British anti-monarchist party, to suggest to the public that Jackson was bent on ruling as a king. The problem with defining a party by its opposition to an individual is that there's no future in it. 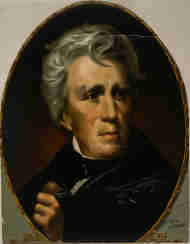 By the time the Whigs were organized enough to participate in the 1836 presidential campaign, the Jackson presidency was already coming to an end. No wonder, then, that they failed in that election to defeat Martin Van Buren, who notably lacked the stature, ambition, and cantankerous nature of his predecessor. When running against Van Buren, it served little purpose to be so virulently anti-Jackson. Conceived as an opposition party, the Whigs tried in vain after the fact to cobble together a set of uniting principles. They were stymied, however, by slavery, which became a more dominant issue as arguments raged over which new territories would become free or slave states. Incredible as it may seem, a major political party founded shortly after the Missouri Compromise had not bothered to establish a position on the slavery issue at its inception. The Compromise of 1850 forced the Whigs to finally reckon with it. The anti-slavery "Conscience Whigs" were outraged by the Fugitive Slave Act that was part of that deal, but were opposed in their own party by the pro-slavery "Cotton Whigs." The impasse ended when the Conscience Whigs broke away and founded the Republican Party, where they were joined by members of the disbanding Free Soil Party. After just 27 years of existence, the Whigs officially became defunct in 1860, although they had ceased to be a formidable political force six years sooner. Like the Whigs, the Democrats have lost the ability to transmit a clear and consistent message. This is particularly true in regard to their criticisms of the prosecution of the war. President Bush didn't send enough troops to Iraq, they say, but he also needed to start brining them home immediately. The administration's homeland security measures are draconian, however they don't go far enough. We need to bring aboard more allies, yet the ones we already have are insignificant. The president is trying to fight the war "on the cheap," but he is spending far too much money doing it. It's reckless to "go it alone" in the war, and it's also irresponsible to "outsource" a mission to our allies. These arguments are irreconcilable, other than that they are consistently anti-Dubya. While it's true that the Republicans also had a personal animosity toward President Clinton, they didn't let their party be defined by it. Instead of merely becoming the anti-Clinton party, they set forth their own agenda, consistent with traditional Republican principles, in the Contract With America. Not only was the contract not a personal affront to Clinton, but he was eventually persuaded to sign a majority of its provisions into law. Rather than produce any comparable initiative, the Democrats continue to focus their energies on railing against a man who will not be running another campaign. Their endless denunciations of George W. Bush will be of no use to them in 2008, when the Republican candidate is likely to be somebody who's not even part of the Bush administration. Some Democrats have started grumbling that they would have succeeded in 2004, except that John Kerry was a bad candidate. To the contrary, Kerry fared much better in the presidential race than his party did in the election overall, and it's not hard to understand why. Sen. Kerry immunized himself to a degree against the Democrats' Federalist problem, by making his service in Vietnam the cornerstone of his campaign. Regardless of what came to light about his postwar activities, the "band of brothers" who stood by him at the convention were enough to nullify the patriotism issue in the eyes of many. Furthermore, John Kerry was the one candidate who figured to gain from his party's Whig problem, for the simple reason that he was the only one running directly against President Bush. Polls consistently showed that the Massachusetts senator was benefiting more from sentiment against Bush than from any positive attributes of a speculative Kerry presidency. As a result of the Democrats' relentless personal campaign against the president, their candidate only lost by a margin of 51 percent to 48. In congressional races, by contrast, the Republicans expanded their majorities to margins of 30 seats in the House and 11 in the Senate. Democrat congressional candidates, since they weren't running against Bush, needed to offer voters specific reasons to vote for them. Without a coherent message coming from the party on a national level, the individual candidates were basically left to fend for themselves. It's often said that those who ignore history are doomed to repeat it. Judging from delusional accounts of the Democrats' past given by their speakers at last year's convention, they aren't even aware of their own party's history, let alone those of the Federalists and Whigs. With another congressional election less than two years away, they'd better start boning up in a hurry.